Burwood Shutters strong and durable range of aluminium window grilles effectively protect your home and family against intruders. 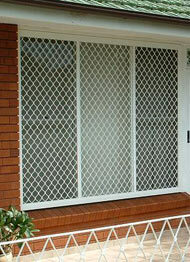 Available in a standard single or decorative double diamond grille design in a wide range of colours to suit any decor. Our custom made window grilles consist of a strong aluminium frame and heavy duty 7mm thick grilles that will ensure many years of maintenance-free protection. Flyscreening included to cover window openings.